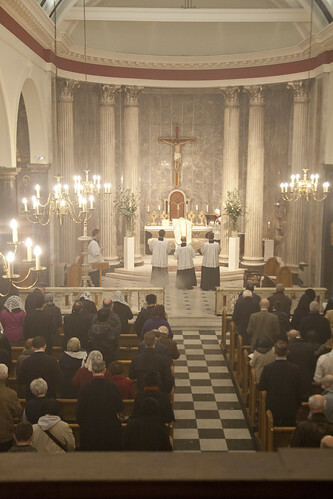 For the first time I attended the Easter Vigil organised by the Latin Mass Society in London; I also went to one of the Tenebrae services which made up the full set of services offered in St Mary Moorfields in the City. 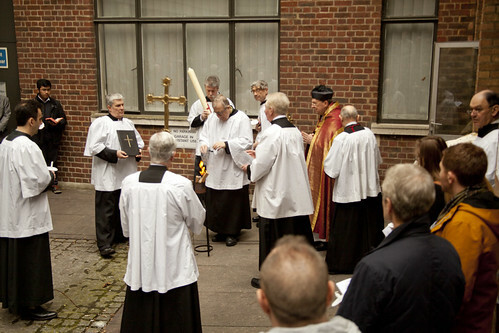 The Easter fire is lit in a little alley which gives access to a back door into the church's sacristy. 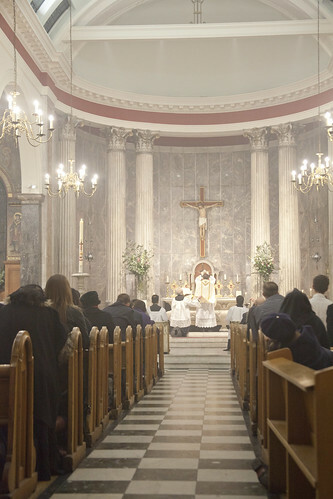 From there we processed round to the front and into the church. 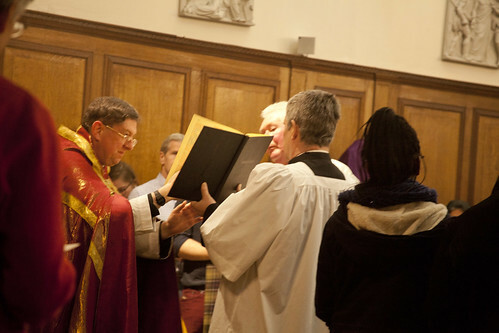 Our celebrant was Fr Michael Cullinan. 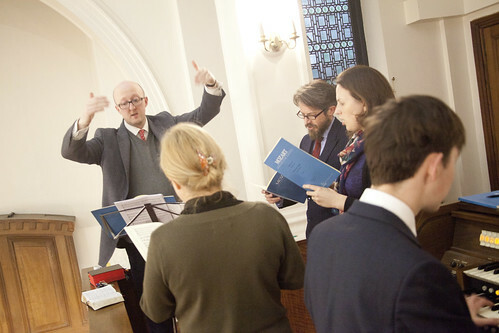 The choir, Cantus Magnus, led by Matthew Schellhorn, singing Mozart's Coronation Mass. 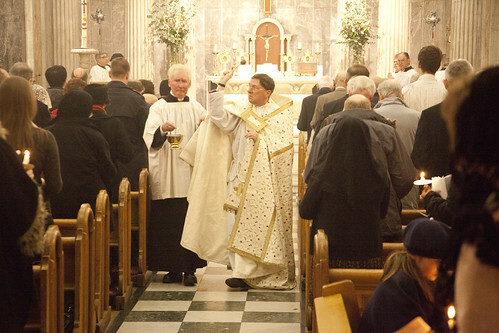 Is Fr Michael wearing a Cassio? That just completes the picture. Pictures look great. 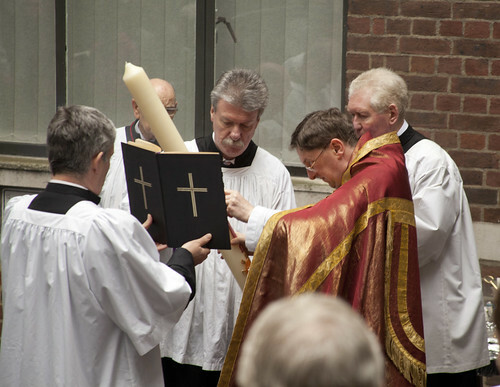 Was Mass celebrated according to the pre-1955 rubrics? 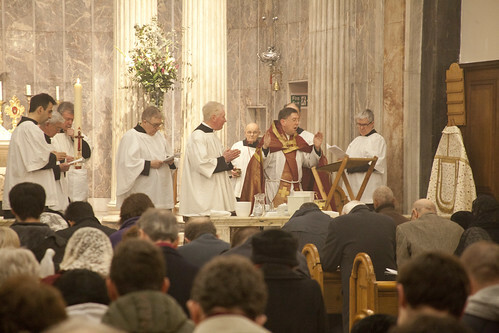 I would have thought it self-evident from the photographs that the reformed rite was being celebrated: Paschal candle being blessed outside, absence of the triple candle; same Paschal candle stuck in the middle of the sanctuary; blessing of water in the plastic containers versus populum rather than the font; the OHSI; the appearance of the white cope - to note just the changes in the photographs in the post and not the full Flickr set. 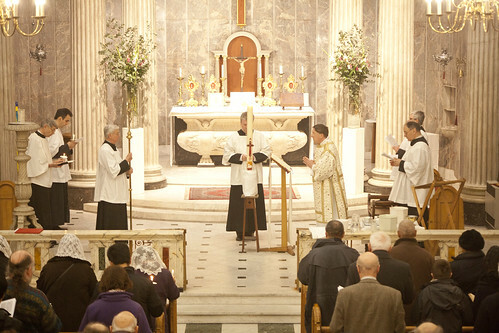 Not being lucky enough to have an Easter Vigil in the EF available to me I'm not terribly familiar with the rubrics. I asked, purely because the daylight made it seem quite early. 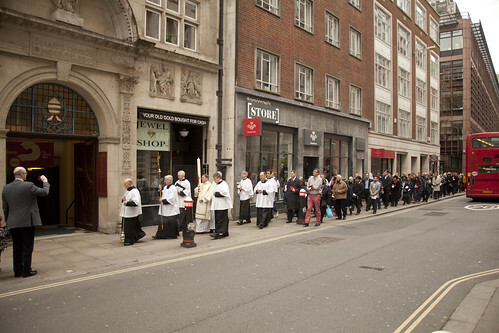 It was at 4pm, to leave room for the OF Vigil in the same church. What you have to understand is that for Patricus and Rubricarius it is painful to contemplate the ceremonies being performed in the post-55 form, and of course they can tell at a glance from almost any photo taken at any stage in the proceedings which ceremonies are being used, particularly in the case of the Vigil. However the LMS feels obliged to use the books as they were in 1962, so that's what we always do.